This morning, I went for my usual run-walk. It went pretty well, and I was happy to notice that I’m definitely feeling stronger and building up more endurance. I was doing my cool-down walk on an uphill stretch. I let my vision shift as I kept my eyes on the trees ahead, so I wouldn’t be tempted to look down and strain my neck. Suddenly I saw something completely unexpected—and completely amazing. 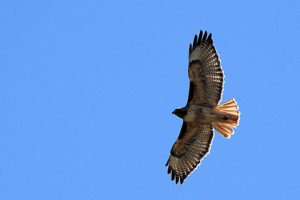 About 15 feet in front of me was a red-tailed hawk. It flew straight across my path and landed in a tree branch just off the walkway, with its back to me (and the sun). No one else was nearby, so this gift was for me alone. I stopped and stared in amazement. We have plenty of red-tails in New York City, including the famous Pale Male and his offspring, but I’d never seen one so close before. I don’t bring my iPhone when I run, so I had only this moment to see it. A long time ago, a running coach told me, “Runners see things that other people don’t.” I’ve never forgotten her words, and I think of them whenever I see or hear something unusual or especially beautiful—the morning star, trees and flowers, a chorus of birds. Has anyone out there had similar experiences? I’d love to hear your thoughts.